This SOS parade was last Saturday and once again it was a success. The ODSC had a great entry and lots of fun for the umpteenth consecutive year! For the past 14 years, the ODSC has entered and taken 1st place every year in Best Shag Troop. This is an outstanding accomplishment. This year, we decided to shake things up and enter what many consider the top prize….Best Shag Theme. With the participation and support of 60+ members of our club, we had an outstanding entry under the banner of SOS – A Thriller. Almost everyone who participated also helped build the float and I am not sure what we would had done without their help. Our float was decorated to mimic scenes from the video, Thriller. There was a crypt, graveyard, movie marquee, a werewolf and many, many zombies on the float. In front of the float, a dance team performed a choreographed routine. Many hours of practice showed up in how great they performed in the parade. Following the float were numerous golf carts all decorated creatively filled with zombies, vampires and “Thriller Ball” attendees. A video of the parade is on you-tube and a separate video of the dance team practicing is also available. We have added the video on our website www.odshagclub.com. None of this is possible without the hard work of many members of the ODSC. A special thanks to several people who worked many, many hours on this parade…Jon Harris, Monica Powell, Sonny Tomberlin, Tina Tomberlin. Once again, if you did not participate, you missed a lot of fun and comradery. Oh, by the way, WE WON BEST SHAG THEME! 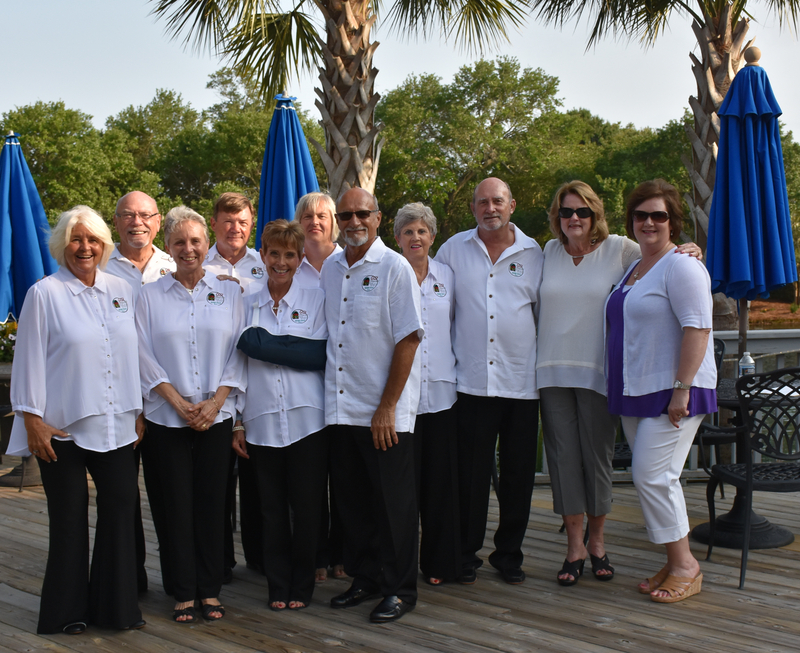 The OD Shag Club Dance Team was invited to the SC General Federation of Woman’s Club State Convention April 27, 2017 at 6PM, held at the Litchfield Beach and Golf Resort, Pawleys Island, SC. We were greeted by our own Dolly McDermott who introduced us to Stephanie Williams President, North Myrtle Beach Woman’s Club and Janet Prince, State President, South Carolina 2016-2018 on the Webster’s Restaurant outside deck for Happy Hour. There was a nice humid breeze and a perfect night for dancing. Linda Campbell the MC began with an introduction as to the Shag Dance. She then introduced the Dance Team. Starting off with Donna and Burnie Williams dancing to Stand Up and Be Strong. You could tell that the coward was beginning to enjoy themselves. After the first dance Linda asked the women how many of them already knew how to Shag. Many of them raised their hands including Mrs. Burgess, there most senior member, who had been shagging for over 60 years. The second to demonstrate was John and Lori Setzer who danced to Everyday Love. The crowd began to clap along and seemed to watch every step. Our third couple was Bob and Helon Page who danced to Before the Night is Though. They are from Sherrills Ford, NC and have been on the dance team for a year and travel here because they love the dance. The 4th and final couple to dance was Lou Martino and Barbara Hopper (because Lou’s partner Linda Campbell had accident and was unable to dance) filled in beautifully and danced to Can’t Stop the Feeling. Thank you, Barbara, for rearranging you schedule to fill in at the last minute. Lou Martino asked the women to divide on one side and the men to be on the other side. However, there were no men except for the four on the dance team. Nonetheless, instructions began and the woman were able to pick up the shag basic within a few minutes. We then asked the members of the dance team to select a member of the Women’s Club to dance. They were willing to participate and many of them even danced with each other. Although the women were supposed to go to dinner at 7PM most of them stayed to dance. After the instructions, we decided to teach a line dance to the music Run for Cover. It was a big hit. We all had a wonderful time. Thank you to the Dance Team mentioned above that showed up for this event knowing that several of you have to work and arranged your schedules to accommodate the Team. 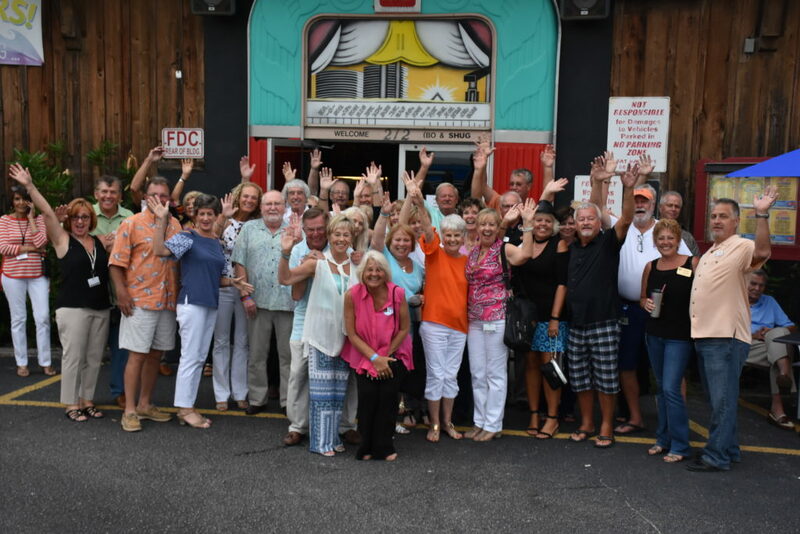 This year the OD Shag Club joined together, socialized and simply had a great time at our bi-annual SOS Club Crawl during 2017 Spring Safari SOS. We began our journey May 25th as we all met at the Pirate’s Cove at 6Pm. There were around 20 members that attended. As we trickled in the President of the OD Shag Club Terry McCoy gave each member a “yellow” ticket for their first drink. There was no line. Since it was early in the evening not many Shaggers were out and about, so we had the whole place to ourselves. This gave those who wanted to dance a chance to show their stuff. Bob and Helon Page introduced the River Waltz and many of the members joined in. There were probably 10 people left as the group emptied the Pirate’s Cove. We all met at the front door and then it was off to Duck’s. It was a sight to see as 20 members of the OD Shag Club walked (we weren’t crawling yet) up main street. There were those watching wondering what was going on. We did get the attention from by-standers. As we entered Duck’s heads turned. We walked through to the back area and had a social gathering. We took up the whole area. It was nice to be able to just sit and talk. Many of the Club members did dance. As 8PM approached, we all got up and left. We made a big impact at both clubs. The second crawl began at the OD Arcade May 27th at 6PM. WOW! We grew since the first crawl. There were around 30 members of the Club that were in attendance. There was a DJ playing great tunes and again there was room to dance. Many of the members enjoyed the fine cuisine that the Arcade has to offer. Then we were off to Fat Harold’s. The club was packed. As we made our way through the crowd we lost our momentum as we just blended in with everyone else. We knew who we were, however, no one else knew that we were even there. It was suggested that next crawl that we wear bright neon T-shirts to really let others know that we are here and we are gone. Over all the Club Crawl was a success. We are looking forward to 2017 Fall Migration SOS. And those who did not participate you just don’t know what you missed. So, save the date for the Fall and join us. The crawl will do you good. 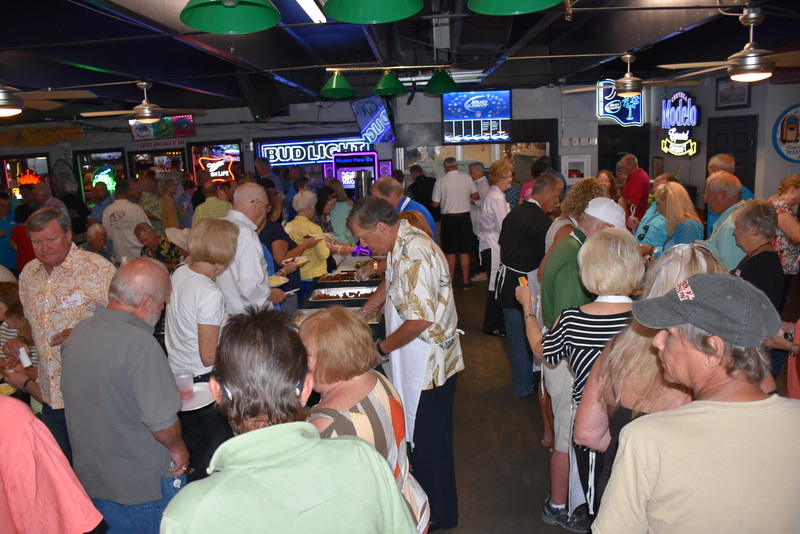 In the words of DJ jimmy Buffkin, everyone had a big time who attended the OD Shag Club 2017 Spring Safari Brunch at the OD Arcade, Sunday April 23. 164 members and 24 guests, twisted, shagged and line danced to the tunes of DJ Murl Augustine, ate the famous breakfast prepared by the OD Arcade Crew and watched in awe as the Junior Shaggers showed all their dance moves. Everyone hoped their number was a winner, but Ronnie Williams won the logo and Jim Livingston took home the name tag money. Wendy Schultz had the lucky number for the 50/50, and donated that $286 to the Juniors, with Terry McCoy donating the club’s half. So, with the pail of $1.00’s, $5.00’s and $20.00’s, OD Shag Club donated $1140 to the Juniors, averaging about $81.00/Junior of the $2000.00 each Junior need to raise for their fabulous trip to Australia in October. Way to go OD Shag Club!!! See ya next year at the 2018 Spring Safari Brunch. As the residents gathered waiting with anticipation of the forthcoming event, the OD Shag Club members were arriving as Easter was in the air. There were Easter decorations everywhere and the members were in the kitchen cutting up the beautifully decorated Bunny cakes that the residents had decorated earlier in the day. The event began with Linda Campbell, MC for the night who welcomed them all and announced that they were in for a fun and exciting time. The OD Shag Club Dance team started off the program by dancing to two songs for the residents. Several of the Dance Team exchange partners so all the dancers could showcase their steps. John and Jan Samuels were up next by showing another dance called “ DC Hand Dance”. The residents really loved that. Next, Lou Martino and four of the dance team girls showed their stuff as Lou danced with all four girls at once. They swirled, moved, twirled and boogie-walked their way to “No More Cloudy Days”. By that time, the music began a crescendo that everyone knew who was to perform next the one and Only Elvis. Gospel songs such as “How Great Thou Art” was evident a favorite of the residents. By that time, the Junior Shaggers had arrived and their energy, fancy steps and fun was all over the place. Everyone was ready for the snack of Bunny cake and punch as the OD Shag Club Members distributed it to the residents. But, there was much more entertainment as Paul Craver, a famous recording artist serenated the residents with a favorite of all of ours with “Make the world go away”. Gail, Paul’s wife then shared a story about her and Paul, which made everyone laugh. Linda then announced that we had one more couple to dance and show their professional moves, as Bill and Sheila Seymour, 2017 National Shag Competitors danced to a song called “Daddy”. Of course, the night wasn’t finished until there was another visit from Elvis as he sang a couple more of their favorite songs such as “Suspicious Minds” and “Only Fools Fall in Love”. Our visit wouldn’t be complete without a visit from, of course, the Easter Bunny. Goody bags were given out by the OD Shag Club Members while strutting in their Easter Bonnets, which looked beautiful as a parade of hats were strolling along, as each member wished the residents a “Happy Easter” and sang to “In your Easter Bonnet”. The night ended as we all sang “God Bless America” and “Que Sera Sera” as members of the OD Shag Club said their goodbyes. A special “THANK YOU” goes to Joe Ferlauto for all his hard work and dedication in organizing, preparing and participating in such a successful time for all the residents. Also, a great thank you goes out to those members of the OD Shag Club who showed up for this event. In the wee hours of a brisk morning the members of the OD Shag Club Dance Team arose at 5 AM to prepare for one of our long awaited events of the year. 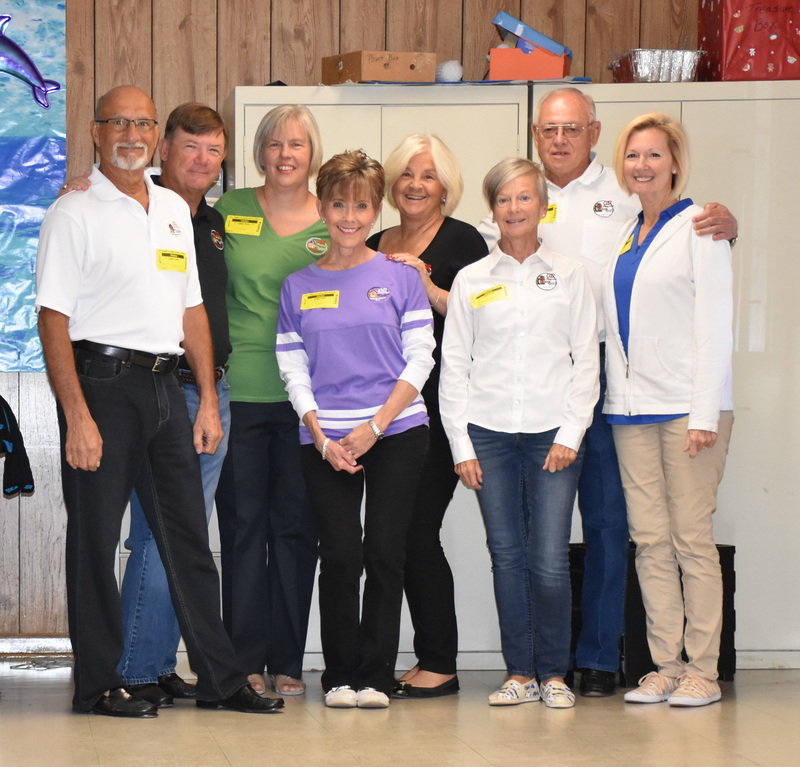 April 7, 2017 nine early risers of the OD Shag Club Dance Team arrived at the Saint James Elementary School in Myrtle Beach, SC. At 7 AM Ms. Kayleigh Vanlandingham and Ms. Jenna Jones the music teacher where our points of contact and met us in the lobby of the school and explained the Fine Arts Day schedule. We were supposed to dance outside the school, however, the morning chill of 50° with a wind-chill factor did not warrant the location. After a few minutes, they decided that we would dance in one of the outside classrooms. It was a perfect location to perform and teach the shag dance. We set up our equipment and waited for the first wave of children or students to arrive. We were to demonstrate and teach grades kindergarten through first grade ages 5 to 7 years old. Our schedule was to see 40 students every 25 minutes with a five-minute break between sessions, which totaled 340 students. After 15 minutes of a dedicated March of the whole school for the March of Dimes and after the Pledge of Allegiance the students began to arrive. The children were very disciplined and were instructed to set on the floor directed by their teachers and their assistants ready to observe and more importantly learn to dance. Linda Campbell began her introductions and asked if any students wanted to learn how to dance. They were all very enthusiastic to learn. Each group of 40 students had their own personalities which was a welcomed environment to teach. Prior to each session the OD shag club dance team demonstrated the Shag dance. Ms Campbell explained the rules to the students: first you had to learn to smile; you had to learn to count to six; know you’re right from your left and learn march. The class began one and two; three and 4; 5 – 6 the students were naturals. Linda divided the boys on the left and the girls to the right. Then the children were asked to find a partner. At first there were groans and moans because the boys and the girls had to touch each other. (Ooos and Awws). Over all, these children were ready to learn the dance and even some of the teachers participated. To see the results of each class’s enthusiasm check out the photos of this event. The last thoughts that we left them with: was to keep smiling; keep dancing; keep music in their hearts and always have fun. Well spring is upon us and SOS is just around the corner April 21st thru the 30th of April. Hope everyone is ready for the parade on April 29, 2017. If you need help with your golf cart contact Billy Powell at email address: bpowell948@gmail.com or 704-231-9818. We are still in need of volunteers for walkers and riders on the float please also contact Billy Powell. We will also need volunteers for golf cart sales and Ways and Means at the tents in the parking lot of Fat Harold’s please sign up if you can work by contacting Kathy McCoy kathyshopnmb@gmail.com and Connie Livingston conniedliv@gmail.com Watch for emails about the Bar Crawl during SOS. Hope to see everyone at the SOS brunch April 23, 2017 at the OD Arcade.